Posole is like a marriage of chili & gumbo…and the longer you let it sit, the better it tastes! DIRECTIONS: GO GATHER ALL YOUR INGREDIENTS, open cans, cut up, measure etc. then start!! Now put slow cooker on for 2 hours and let the smell permeate throughout your house…or, you can put it in a stew pot and bring it to a boil, then reduce the heat and simmer for 30 mins until the meat is tender. Just depends in what kind of rush you are in!!! Take the other can of hominy (that was drained) and add it to a food processor and blend it till it is pureed. Add the other 1/2 c of chicken broth at the same time. This pureed hominy thickens the stew. If you are using the slow cooker, take the lid off and after an hour, add the pureed AND the whole hominy to your pot and let cook for the last hour. Finally, when it is ready, take out and serve into bowls…add as much cilantro that you would like, some cheese if you so desire, and then squeeze the lime on top and PHEW…it is worth the work! Thank you starman5 for the inspiration on making this. What a hit and a new FAVORITE!!! Now go and gather everything and put on counter, then open cans, measure ingredients, chop chicken & onion etc….and THEN you are ready to go!!!! 2. Take all the rest of the ingredients and put into crock pot/slow cooker along with the onion mixture and set to high. Cook for about 2 hours and you are ready to go!! Top with grated Monterey jack cheese, green onions and some chopped cilantro!!! Could this be any easier????? I mean, SERIOUSLY!!!! First thing: READ the recipe!! Make sure you have everything on it, then go and gather EVERYTHING up in a roasting pan and put on counter. Next, chop, slice, measure and pour!! Have that all done before you even think of turning on the stove to start cooking. It makes it soooo much easier if you are prepared like this. Cut ribs into 3 or 4 rib serving size portions. Place in bowl of slow cooker. Sprinkle with sale & pepper, turning evenly to coat. Add ½ of celery & ½ of onion. Cover and cook on high setting for 3-4 hrs or on low setting for 5-6 hours. Turn meat half way through. You’ll know it’s ready when it falls right off the bone! Before serving, melt the butter in a saucepan over medium heat. Next add the other half of both the onion/celery mixture and stir frequently until soft (about 5 minutes). Now, whisk in the vinegar, chili sauce or ketchup, brown sugar, worcestershire, dry mustard, pepper flakes, garlic and the lemon slices. Be sure to remove the seeds from the lemon slices before cooking them. Bring to a boil and then reduce heat and simmer, stirring often for about 5 minutes. Or, you can make the sauce up to 2 days ahead and refrigerate. Reheat before serving. Place the ribs on a large platter or plates. Drizzle with warm sauce. This is awesome with mashed potatoes!!! SERVES 4!!! !……………………………….I doubled the recipe for this video. Prepare the Jell-O instant pudding per directions using a mixer and then pour this over the cake layer. Cook in the crock pot on “HIGH” setting for about 2-2 ½ hrs until the cake is moist but not “jiggley” and you see little volcanoes of spitting chocolate on top. Serve with whipped cream or ice cream!!!! You had a GREAT prime rib dinner…and now, after having the usual sandwich’s the next day, you “still” have leftovers!!! What is a cook to do??? Hahahaha…you once again, go and get that “favorite” appliance…the crock pot and you gather all the mixin’s below, put it in the pot and cover it for 6-8 hours and you will become the “kitchen goddess” in the eyes of your family or friends!!! TRUST ME!!! 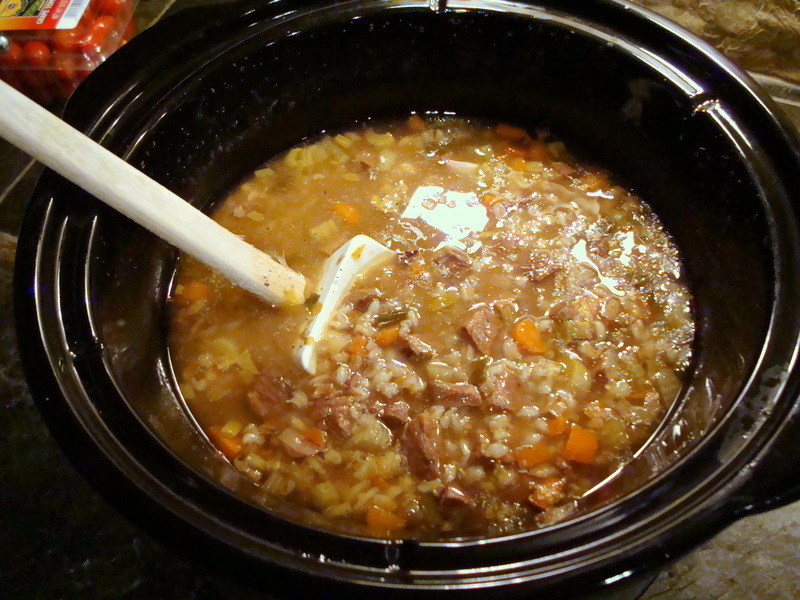 Take the leftover beef and cut away the visible fat, then cube it and put in crock pot. Take all the chopped vegetables, beef broth, water, seasonings, parsley and barley and put into pot. Cover and cook on Low setting for 6-8 hours or until vegetables and barley are tender OR you can put the crock pot on High and cook for 2 hours! COULD IT BE ANY EASIER?? And the picture above was taken from my finished product!!! Combine reserved bacon, beef, onions, and the rest of the ingredients in a 5 Qt slow cooker. Cover and cook on “LOW” 7 hrs or until beef & vegetables are tender. 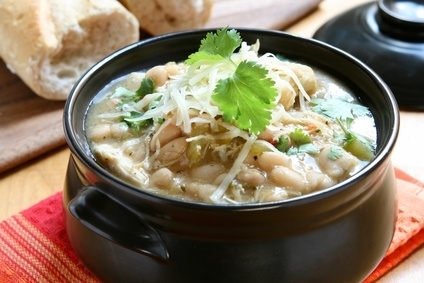 If consistency is too watery, add 1-2 TBS of cornstarch to 2 tsp water, mix and then add to stew. And the best….a nice corn bread AND a wonderful glass of a Red Zinfandel wine…or, of course, a Negra Modelo beer!!! Again, the choice is ALWAYS yours!! !